It is recommended to use travel car seat for all children under the age of 12 when travelling in a vehicle. It is even required by law in many countries and there are penalties to pay if you break the law. More importantly though, it is about your child safety on car journeys. Increased number of countries require by law car seat for all children travelling in a vehicle (some exceptions apply). However, up to what age travel car seat is required varies between countries. The safest way to stay within the law is therefore to travel always with car seat when travelling with kids under 12 years of age. It is also safest for your children. The type of car seat your child needs depends on your child's weight. Car seat with back and own straps is required for younger children while booster seats are suitable for older ones. Booster seat raises your child in the car seat so they can use the adult seat belt and benefit from the safety that wearing a seat belt gives car passengers. The UK Regulation is based on the European Union legislation and requires car seat to be used for all children until they have reached 135 centimeters in height (4' 5”) or the age of 12. 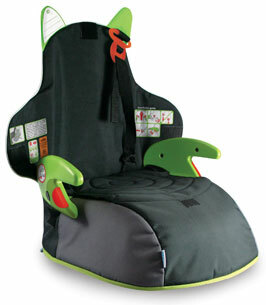 Booster travel car seats are suitable for children over 15 kg (33 lbs). Booster car seat laws vary across the United States as each state sets their own guidelines. This means you could be complying with the law in one state but breaking the law if you cross into a neighboring state. The majority of the states in the US demand booster seat until children reach at least 60 pounds (27 kg) or 6 years of age... some though demand up to 80 pounds (36 kg) and / or 9 years of age. The safest way is to check in advance if planning to drive from one state to another... or bring travel car seat along just in case. Why Booster Travel Car Seat? Booster seat is not safety equipment as such but using them makes your child safer during car journeys. This is because they boost your child height and allow the seat belt to fit them properly as it would fit an adult, i.e. to sit firmly across the collarbone and chest, with the lap portion fitted to the hips. If the seat belt is not across the collarbone and the hips, it can ride across the neck and stomach, which can cause internal damage in the event of a collision. Children using booster seats are less likely to suffer head, spinal cord, and abdominal injuries in a crash. Booster travel car seat can therefore protect children from serious injuries and save lives. Booster seats usually do not have back and some argue they therefore do not protect the children as well as safety seats with backs would do. This is why backless car seats are not allowed until children have reached certain minimum weight. Booster seats take less space and are the most practical car seat when travelling. However, even having booster seat with you all the time can be challenging, i.e. when travelling abroad, giving friends kids a lift, taking taxi or bus, etc. Trunki BoostApak is designed to solve exactly this problem, i.e. it is spacious cabin size childrens luggage back pack that doubles as a booster seat... making it perfect for family holiday as well as car pooling. We know that bringing booster travel car seat along when travelling with kids under 12 years of age is the safest option... so how about one that is not only travel car seat but also children's luggage? This multipurpose makes BoostApak ideal for family holidays. You can store you kid luggage and carry your BoostApak as any backpack... but change it into booster car seat when needed. Whether you are travelling by car, taxi or bus your kids can be safe in their booster seat. You cannot use booster car seat on planes but BoostApak is approved as hand luggage and can fit under the seat in front of you or in the overhead cabin. However, when you arrive at your destination you will have travel car seat whenever you need it. BoostApak is not only great for travelling, they can be used as everyday booster seat as well or when giving your kids friends lift home. You can also use them whenever you want to booster your child height, like when going to the cinema, on train journeys, etc. BoostApak is certified to regulation ECE R44.04 for group 2 and 3, making it suitable for children aged between 4 - 12 years. You can use BoostApak for children over 15 kg (33 lbs) and up to 36 kg (79 lbs), or 135 cm. height (4' 5”). They are made from durable material and can be adjusted as the child grows, i.e. your BoostApak will grow with your child. Trunki BoostApak is easy to install and there are clear instructions printed on the seat itself if needed. They are also easy to clean as they come with wipe-clean removable cover. They offer ergonomic back support, i.e. to encourage good posture for growing spines. They meet all current safety standards, i.e. as safe as any other approved booster seats. 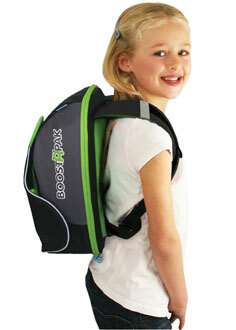 They have high visibility trim making your child safer when using BoostApak as backpack. It can though be little heavy for the youngest one (1.5 kg) so be careful not to over pack it, or carry it for them. When going on a long car journey do not forget to remove the things you need during your trip from your BoostApak prior to installing it. It is BoostApak multi use that makes this product so exciting, i.e. kid luggage, car seat and child accessory all in one. This video shows how the Trunki BoostApak travel car seat works in practice. You can buy your Trunki BoostApak online from Amazon.